NSTC-003 Cast iron Edwardian tiled combination fully restored and ready to go as a working fireplace. Pictured with a set of original fireplace tiles, sold separately. The tiles can be changed with others from our collection, we have over 150 sets of reclaimed fireplace tiles to choose from. This fireplace can also be supplied without tiles should you wish to provide your own. NSTC-002 Cast iron tiled combination fully restored and ready to go as a working fireplace. Pictured with a set of original fireplace tiles, sold separately. The tiles can be changed with others from our collection, we have over 150 sets of reclaimed fireplace tiles to choose from. This fireplace can also be supplied without tiles should you wish to provide your own. BSTC-034 Cast iron tiled combination fully restored and ready to go as a working fireplace. Pictured with a set of original fireplace tiles, sold separately. The tiles can be changed with others from our collection, we have over 150 sets of reclaimed fireplace tiles to choose from. This fireplace can also be supplied without tiles should you wish to provide your own. LSTC-0012 Cast iron Edwardian tiled combination fully restored and ready to go as a working fireplace. Pictured with a set of original red brick fireplace tiles, sold separately. The tiles can be changed with others from our collection, we have over 150 sets of reclaimed fireplace tiles to choose from. This fireplace can also be supplied without tiles should you wish to provide your own. LSTC-008 Cast iron tiled combination fully restored and ready to go as a working fireplace. Pictured with a set of reproduction fireplace tiles, sold separately. The tiles can be changed with others from our collection, we have over 150 sets of reclaimed fireplace tiles to choose from. This fireplace can also be supplied without tiles should you wish to provide your own. LSTC-010 Cast iron tiled combination fully restored and ready to go as a working fireplace. Pictured with a set of reproduction fireplace tiles, sold separately. The tiles can be changed with others from our collection, we have over 150 sets of reclaimed fireplace tiles to choose from. This fireplace can also be supplied without tiles should you wish to provide your own. LSTC-009 Cast iron tiled combination fully restored and ready to go as a working fireplace. Pictured with a set of reproduction fireplace tiles, sold separately. The tiles can be changed with others from our collection, we have over 150 sets of reclaimed fireplace tiles to choose from. This fireplace can also be supplied without tiles should you wish to provide your own. LSTC-008 Cast iron tiled combination fully restored and ready to go as a working fireplace. Pictured with a set of original antique fireplace tiles, sold separately. The tiles can be changed with others from our collection, we have over 150 sets of reclaimed fireplace tiles to choose from. This fireplace can also be supplied without tiles should you wish to provide your own. LSTC-007 Cast iron tiled combination fully restored and ready to go as a working fireplace. Pictured with a set of reproduction fireplace tiles, sold separately. The tiles can be changed with others from our collection, we have over 150 sets of reclaimed fireplace tiles to choose from. This fireplace can also be supplied without tiles should you wish to provide your own. Reclaimed Edwardian tiled cast iron combination fireplace restored and ready to go. BSTC-023 Cast iron Edwardian tiled combination fully restored and ready to go as a working fireplace. Pictured with a set of original green brick fireplace tiles, sold separately. The tiles can be changed with others from our collection, we have over 150 sets of reclaimed fireplace tiles to choose from. This fireplace can also be supplied without tiles should you wish to provide your own. BSTC-022 Cast iron tiled combination fully restored and ready to go as a working fireplace. Pictured with a set of reproduction fireplace tiles, sold separately. The tiles can be changed with others from our collection, we have over 150 sets of reclaimed fireplace tiles to choose from. This fireplace can also be supplied without tiles should you wish to provide your own. 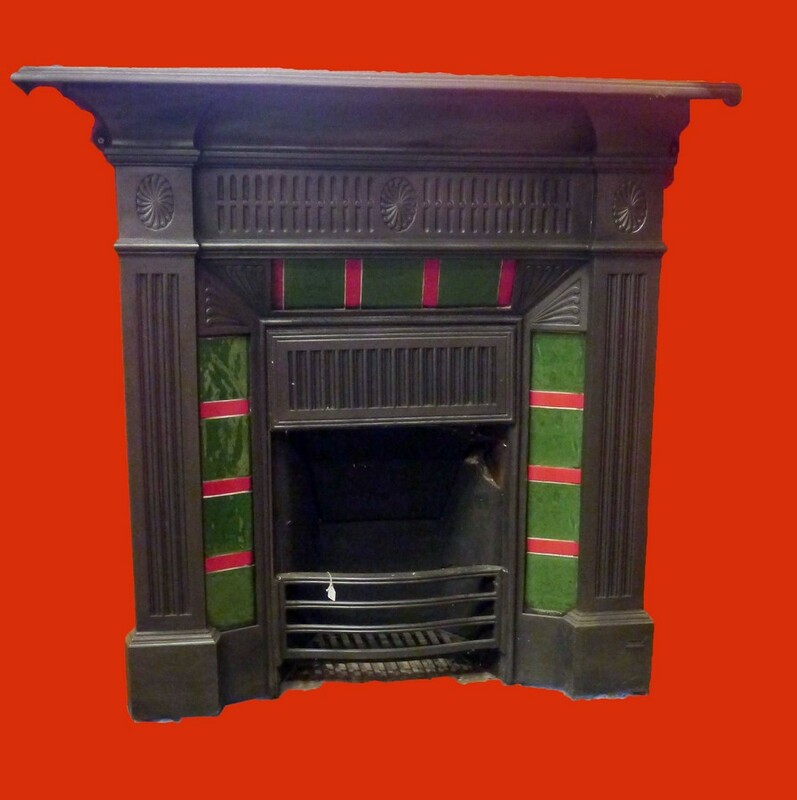 BSTC-032 Cast iron Edwardian tiled combination fully restored and ready to go as a working fireplace. Pictured with a set of original fireplace tiles, sold separately. The tiles can be changed with others from our collection, we have over 150 sets of reclaimed fireplace tiles to choose from. This fireplace can also be supplied without tiles should you wish to provide your own. BSTC-031 Cast iron Edwardian tiled combination fully restored and ready to go as a working fireplace. Pictured with a set of original fireplace tiles, sold separately. The tiles can be changed with others from our collection, we have over 150 sets of reclaimed fireplace tiles to choose from. This fireplace can also be supplied without tiles should you wish to provide your own. BSTC-030 Cast iron Edwardian tiled combination fully restored and ready to go as a working fireplace. Pictured with a set of original fireplace tiles, sold separately. The tiles can be changed with others from our collection, we have over 150 sets of reclaimed fireplace tiles to choose from. This fireplace can also be supplied without tiles should you wish to provide your own. BSTC-029 Cast iron Edwardian tiled combination fully restored and ready to go as a working fireplace. Pictured with a set of original fireplace tiles, sold separately. The tiles can be changed with others from our collection, we have over 150 sets of reclaimed fireplace tiles to choose from. This fireplace can also be supplied without tiles should you wish to provide your own. 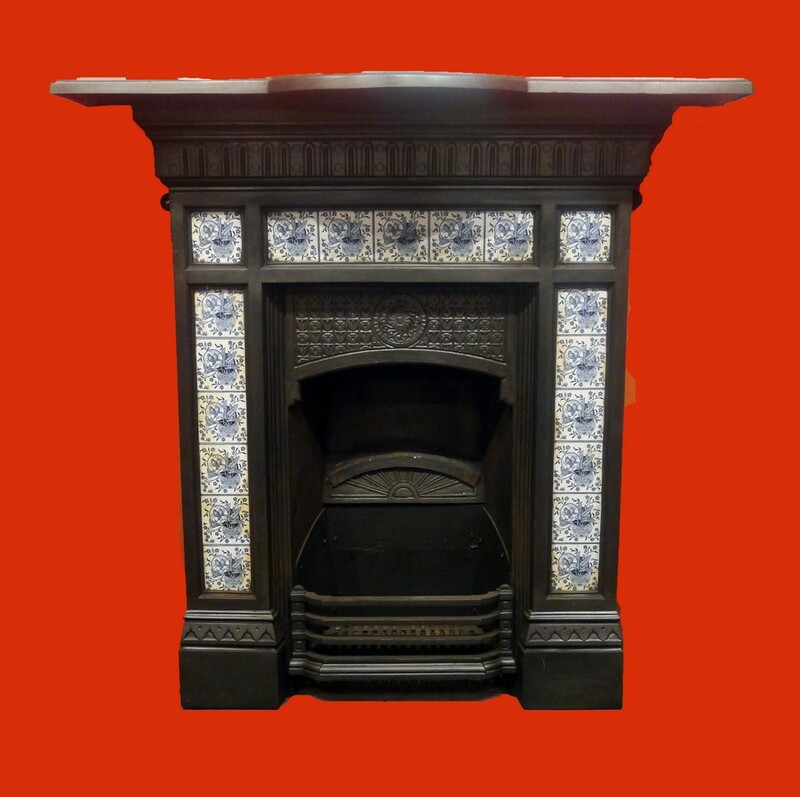 BSTC-028 Cast iron Victorian tiled combination fully restored and ready to go as a working fireplace. Pictured with a set of original fireplace tiles, sold separately. The tiles can be changed with others from our collection, we have over 150 sets of reclaimed fireplace tiles to choose from. This fireplace can also be supplied without tiles should you wish to provide your own. Tiled combination fireplaces are a All-In-One fire that consists of a surround and fire grate in one. They do not require anything further apart from your choice of tiles which can be chosen from our stock of tile sets. A selection of our reclaimed combination fireplaces can be found on here, but we have many more awaiting restoration. So please contact us today if you cannot find what you are looking for or pop in and have a browse around.